Life’s Abundance Dog Food is created and formulated by a veterinarian. It is created to offer your dog all the nutrition they need to become healthy. The main ingredients include high-quality chicken and catfish meals, fresh vegetables and fruits, whole grains, omega fatty acids and many more. Most of the ingredients used to create this healthy dog food are natural. The manufacturer doesn’t use fillers, by-products and cornmeal to avoid complications. All dog food products, they produce, are full of anti-oxidants to reduce the free-radicals from your dog’s body. It is rich in high-quality protein that will sustain the energy requirement of your dog. Dogs are primarily meat eaters just like their ancestors, their teeth are designed to tear chunks of meat. Your dog’s natural diet includes bones, fish and animal guts, meats and vegetables. When they are domesticated they were trained to eat human food leftovers which cover their true diet. Dog’s ancestors were attracted to human garbage in search of food which eventually tamed and became our companions. Your dog is actually carnivore which means he needs plenty of meat in his diet. Proteins are the main nutrient needed by dogs to maintain their body and form. It is the building block of their health and wellness. Carbohydrates are not that important in your dog’s meal and not all types of carbohydrates are good for your dog. There are types of carbohydrates that are hard to digest and may lead to obesity. Most of these poor carbohydrates came from cereal based products. It is good to feed your dog a home-cooked meal. It is much safer and will assure you of the ingredients that it contains are from a good source. However, it will take much of your time and you will not be assured that the right amount of nutrients is properly given. If you find it hard to cook your own dog meal, you can still find a dog food that has the same quality as a home cooked meal. Life’s Abundance dog food is among the best and the healthiest dog food on the market today. They only use fresh human-quality ingredients like natural quality chicken, catfish, farmed eggs, fresh fruits and vegetables. Many dog food companies reduced the quality of their ingredients to get more income. However, it reduced the quality of their finished products. Life’s Abundance Dog food has the best ingredients with great quality. The company made sure that all nutrients in their dog food are well balanced to provide the best nutrition and to avoid complications. Your dog will surely love the taste which will improve his appetite. Life’s Abundance ingredients are all fresh and human-quality which makes it a quality premium dog food. It also contains a good amount of good bacteria to assist the digestion of your dog. This dog food has no artificial colors, sugars, flavors and chemical preservatives. Your dog might have digestion problems if he consumes a dog food with additives or fillers. Dog food with fillers can’t supply the necessary nutrients and will only give your dog tummy problems or a foul stool. Other dog food brands use extreme heat to process their dog food. This process degrades the ingredients reducing the vitamins and minerals which are heat-sensitive. Life’s Abundance dog food in Ruthton Minnesota went through a safe and a healthy cooking process; the “fast cook” process. They don’t use extreme heat for it will reduce the nutrients and the quality of the ingredients. Their cooking process will lock-in more natural goodness, taste and nutrients to the dog food they create. Their re-sealable oxygen resistant packaging protects the food inside which makes it safer and healthier to consume. Your dog needs to have the complete nutrition to live a healthy and quality life. If you are looking for a dog food that is packed with nutrients, safe and healthy, then you must try Life’s Abundance. This entry was posted in Life's Abundance on March 27, 2017 by petfoodadvisor. Life’s Abundance Dog Food is created and formulated by a veterinarian. It is created to offer your dog all the nutrition they need to become healthy. The main ingredients include high-quality chicken and catfish meals, fresh vegetables and fruits, whole grains, omega fatty acids and many more. Most of the ingredients used to create Life’s Abundance pet food are natural. The manufacturer doesn’t use fillers, by-products and cornmeal to avoid complications. All dog food products, they produce, are full of anti-oxidants to reduce the free-radicals from your dog’s body. It is rich in high-quality protein that will sustain the energy requirement of your dog. Life’s Abundance dog food in Russell Minnesota went through a safe and a healthy cooking process; the “fast cook” process. They don’t use extreme heat for it will reduce the nutrients and the quality of the ingredients. Their cooking process will lock-in more natural goodness, taste and nutrients to the dog food they create. Their re-sealable oxygen resistant packaging protects the food inside which makes it safer and healthier to consume. Your dog needs to have the complete nutrition to live a healthy and quality life. If you are looking for a dog food that is packed with nutrients, safe and healthy, then you must try Life’s Abundance. Life’s Abundance Dog Food is created and formulated by a veterinarian. It is created to offer your dog all the nutrition they need to become healthy. The main ingredients include high-quality chicken and catfish meals, fresh vegetables and fruits, whole grains, omega fatty acids and many more. Most of the ingredients used to create Life’s Abundance dog food are natural. The manufacturer doesn’t use fillers, by-products and cornmeal to avoid complications. All dog food products, they produce, are full of anti-oxidants to reduce the free-radicals from your dog’s body. It is rich in high-quality protein that will sustain the energy requirement of your dog. Life’s Abundance dog food in Rushford Minnesota went through a safe and a healthy cooking process; the “fast cook” process. They don’t use extreme heat for it will reduce the nutrients and the quality of the ingredients. Their cooking process will lock-in more natural goodness, taste and nutrients to the dog food they create. Their re-sealable oxygen resistant packaging protects the food inside which makes it safer and healthier to consume. Your dog needs to have the complete nutrition to live a healthy and quality life. If you are looking for a dog food that is packed with nutrients, safe and healthy, then you must try Life’s Abundance. Life’s Abundance dog food in Rush City Minnesota went through a safe and a healthy cooking process; the “fast cook” process. They don’t use extreme heat for it will reduce the nutrients and the quality of the ingredients. Their cooking process will lock-in more natural goodness, taste and nutrients to the dog food they create. Their re-sealable oxygen resistant packaging protects the food inside which makes it safer and healthier to consume. Your dog needs to have the complete nutrition to live a healthy and quality life. If you are looking for a dog food that is packed with nutrients, safe and healthy, then you must try Life’s Abundance. Life’s Abundance dog food in Royalton Minnesota went through a safe and a healthy cooking process; the “fast cook” process. They don’t use extreme heat for it will reduce the nutrients and the quality of the ingredients. Their cooking process will lock-in more natural goodness, taste and nutrients to the dog food they create. Their re-sealable oxygen resistant packaging protects the food inside which makes it safer and healthier to consume. Your dog needs to have the complete nutrition to live a healthy and quality life. If you are looking for a dog food that is packed with nutrients, safe and healthy, then you must try Life’s Abundance. Life’s Abundance Dog Food is created and formulated by a veterinarian. It is created to offer your dog all the nutrition they need to become healthy. The main ingredients include high-quality chicken and catfish meals, fresh vegetables and fruits, whole grains, omega fatty acids and many more. Most of the ingredients used to create Life’s Abundance are natural. The manufacturer doesn’t use fillers, by-products and cornmeal to avoid complications. All dog food products, they produce, are full of anti-oxidants to reduce the free-radicals from your dog’s body. It is rich in high-quality protein that will sustain the energy requirement of your dog. Life’s Abundance dog food ingredients are all fresh and human-quality which makes it a quality premium dog food. It also contains a good amount of good bacteria to assist the digestion of your dog. This dog food has no artificial colors, sugars, flavors and chemical preservatives. Your dog might have digestion problems if he consumes a dog food with additives or fillers. Dog food with fillers can’t supply the necessary nutrients and will only give your dog tummy problems or a foul stool. Other dog food brands use extreme heat to process their dog food. This process degrades the ingredients reducing the vitamins and minerals which are heat-sensitive. Life’s Abundance dog food in Round Lake Minnesota went through a safe and a healthy cooking process; the “fast cook” process. They don’t use extreme heat for it will reduce the nutrients and the quality of the ingredients. Their cooking process will lock-in more natural goodness, taste and nutrients to the dog food they create. Their re-sealable oxygen resistant packaging protects the food inside which makes it safer and healthier to consume. Your dog needs to have the complete nutrition to live a healthy and quality life. If you are looking for a dog food that is packed with nutrients, safe and healthy, then you must try Life’s Abundance. Life’s Abundance dog food in Rothsay Minnesota went through a safe and a healthy cooking process; the “fast cook” process. They don’t use extreme heat for it will reduce the nutrients and the quality of the ingredients. Their cooking process will lock-in more natural goodness, taste and nutrients to the dog food they create. Their re-sealable oxygen resistant packaging protects the food inside which makes it safer and healthier to consume. Your dog needs to have the complete nutrition to live a healthy and quality life. If you are looking for a dog food that is packed with nutrients, safe and healthy, then you must try Life’s Abundance. Life’s Abundance dog food in Rosemount Minnesota went through a safe and a healthy cooking process; the “fast cook” process. They don’t use extreme heat for it will reduce the nutrients and the quality of the ingredients. Their cooking process will lock-in more natural goodness, taste and nutrients to the dog food they create. Their re-sealable oxygen resistant packaging protects the food inside which makes it safer and healthier to consume. Your dog needs to have the complete nutrition to live a healthy and quality life. If you are looking for a dog food that is packed with nutrients, safe and healthy, then you must try Life’s Abundance. Life’s Abundance dog food in Roseau Minnesota went through a safe and a healthy cooking process; the “fast cook” process. They don’t use extreme heat for it will reduce the nutrients and the quality of the ingredients. Their cooking process will lock-in more natural goodness, taste and nutrients to the dog food they create. Their re-sealable oxygen resistant packaging protects the food inside which makes it safer and healthier to consume. Your dog needs to have the complete nutrition to live a healthy and quality life. If you are looking for a dog food that is packed with nutrients, safe and healthy, then you must try Life’s Abundance. This entry was posted in Life's Abundance on March 26, 2017 by petfoodadvisor. Life’s Abundance pet food ingredients are all fresh and human-quality which makes it a quality premium dog food. It also contains a good amount of good bacteria to assist the digestion of your dog. This dog food has no artificial colors, sugars, flavors and chemical preservatives. Your dog might have digestion problems if he consumes a dog food with additives or fillers. Dog food with fillers can’t supply the necessary nutrients and will only give your dog tummy problems or a foul stool. Other dog food brands use extreme heat to process their dog food. This process degrades the ingredients reducing the vitamins and minerals which are heat-sensitive. Life’s Abundance dog food in Rollingstone Minnesota went through a safe and a healthy cooking process; the “fast cook” process. They don’t use extreme heat for it will reduce the nutrients and the quality of the ingredients. Their cooking process will lock-in more natural goodness, taste and nutrients to the dog food they create. Their re-sealable oxygen resistant packaging protects the food inside which makes it safer and healthier to consume. Your dog needs to have the complete nutrition to live a healthy and quality life. 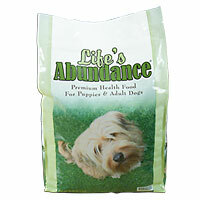 If you are looking for a dog food that is packed with nutrients, safe and healthy, then you must try Life’s Abundance.